Philippa reports on a protest by disability campaigners and UK Uncut yesterday against the Welfare Reform Bill, and details of a petition calling on the government to pause the progression of the Bill to review it. 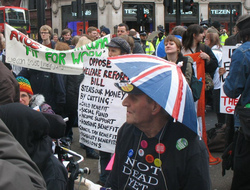 Yesterday, disability campaigners, the Greater London Pensioners Association and UK Uncut staged a protest in London against the Welfare Reform Bill. The bill is set, amongst other things, to get rid of Disability Living Allowance (DLA) and replace it with a Personal Independence Payment (PIP). Disability Living Allowance is a lifeline for disabled people. It is a benefit designed to contribute towards the extra costs of living associated with being disabled. The government, aided by certain parts of the media, have been spreading the message that DLA is claimed predominantly by fakers, taking money that could be used for, presumably, bonuses to the RBS bosses. In reality, the government have stated that they want to cut DLA by 20%, when their own figures show that the fraud rate is only 0.5%, which is the lowest fraud of any benefit other than pensions. During one of the debates in the House of Lords, I learned that 20,000 blind people, 50,000 people with learning disabilitiess, and 100,000 people with psychosis will lose their DLA if the bill is passed. And the company responsible for doing all the DLA / PIP reassessments had just found a man in a coma fit for work. It hardly inspires confidence. The other misinformation which is being propagated is that, until now, all people had to do was fill in a form, and they got allocated DLA for life. That form is, if I remember correctly, 58 A4 pages of utterly soul destroying questions, and proof from doctors, social workers, specialists and nurses is then required. The suggestion that people filled in this form once, and then got riches for life, is also severely misleading. Most people get allocated DLA for a period of one, two or three years. Some get awarded it for life, but they tend to be people whose impairments are also lifelong. The Welfare Reform Bill’s quest to re-assess everybody regularly will waste an awful lot of money and resources by checking that amputees’ legs haven’t grown back, that the blind still cannot see, and incurable conditions remain uncured. There have been numerous suicides already as a result of benefit cuts, including a pregnant woman who jumped to her death holding her baby, after her benefits were stopped. If the Welfare Reform Bill gets passed, the human cost will be vast and devastating. It is fundamentally unfair, and targets the most vulnerable – children, disabled people, single parents. There is a government petition that I implore you to sign, to force the government to pause the passage of the Bill, to properly and thoroughly review it. Sign the petition here, there are only 3 days left. How long before we have Work Houses re-created for the supposedly non-deserving poor and disabled women and men? Of course Work Houses will not be called Work Houses but rehabilitation centres to enable the ‘undeserving’ to learn how to find work and cease being a benefit claimant. Already women who have children and do not have the requisite male head of household present in their family unit are being told they will have their benefits reduced because single mothers are claiming too much benefit and stealing this from the default (sic) male taxpayer! Where will these women and children go? Why on the streets of course because these women are ‘undeserving’ according to Tory rhetoric (lies). Never mind the white middle class men are getting richer and richer and bankers are being awarded huge bonuses for the (non) work they have completed. After all fairness is the issue is it not and fairness is defined by white middle class men for white middle class men’s benefit, so of course it is fair!